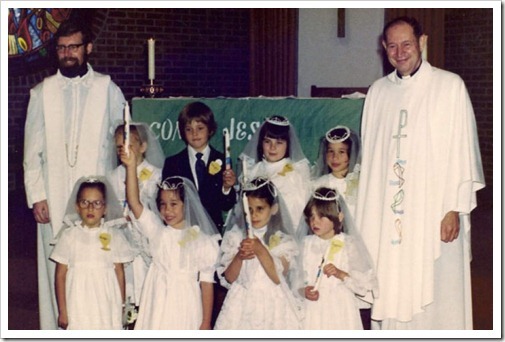 Sr. Bernadette at our christening – she is in the second row next to my godfather. Recently my mother emailed to ask if I could look up a Sister Bernadette Harty of the Sisters of Charity of Nevers in Co. Dun Laoghaire. My mother met her when she attended Sacred Heart College in Japan, and they became fast friends. She told me of how Sr. Bernadette would invite my mom and her friends over to the convent and make them a proper Japanese meal, which was a real treat because the college cafeteria didn’t serve such dishes. She let the girls stay late after dinner for a chat, a welcome break from the rigors of college life. 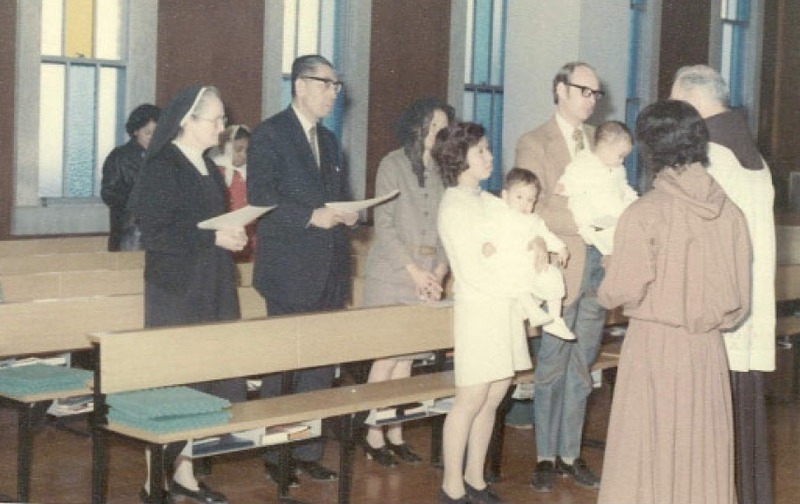 My mother described Sr. Bernadette as a friend and almost like a second mother to her; she helped my mom with her thesis and took her shopping in Shibuya for sewing materials. 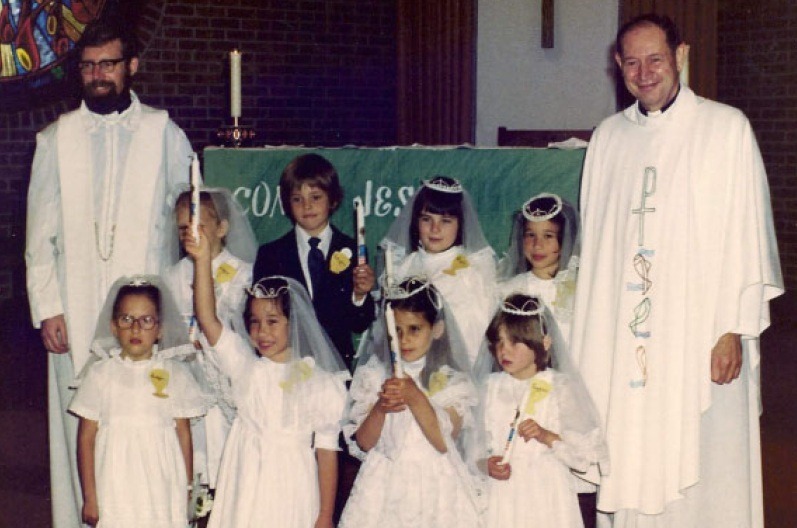 She was also very honest and down-to-earth; when a young Irish priest that Sr. Bernadette knew impregnated a Japanese girl, she told my mother about it rather than try to hide it. 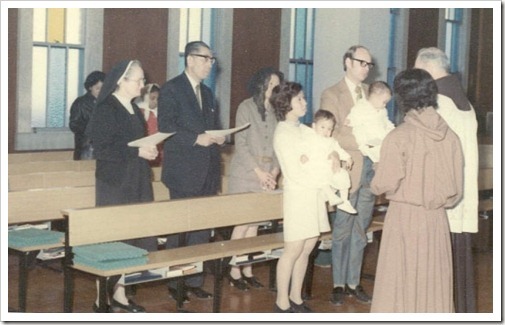 I don’t remember Sr. Bernadette myself, but she was at my christening in Japan. After my mother’s recent email inquiring about the Sister I did some research and found out that she passed away in 2005. My mother had suspected as much, as it was around that time that she stopped receiving the annual Christmas card from Sr. Bernadette, who was living back in Dun Laoghaire until her death. My mom wanted to visit her when my parents come to Dublin this autumn, but sadly that won’t be possible. However my mom will always have fond memories of Sr. Bernadette and is grateful for her kindness and friendship. With all of these Irish connections, it almost seems like moving to Ireland was always in the cards. I’d love to find some relatives of my great-great grandmother, so if the name and birthplace rings a bell, please leave a comment here. It would be amazing to meet up with some of my Irish relatives! Being half-Japanese, I love cooking Asian food here at home in Dublin. I recently came across daikon, a Japanese radish, at the Organic Delights stand at St. Anne’s’ Farmers Market and I knew I had to make one of my favourite childhood side dishes. 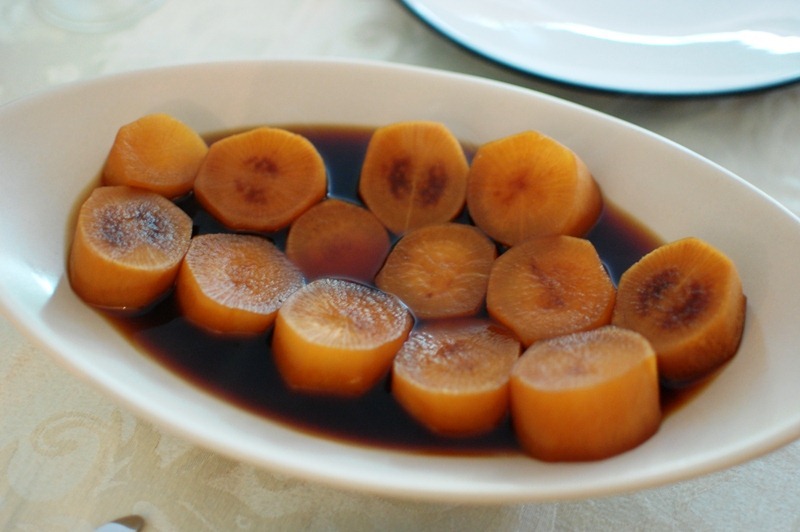 My mother used to braise daikon in a mild broth and the process transformed the hard, slightly bitter radish into a flavourful, tender morsel of goodness! 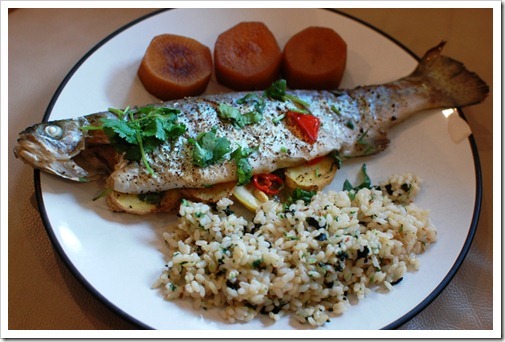 I made it the other night with a main course of roasted trout with Asian dressing. Preheat oven to 170C. Line a baking sheet with foil and coat with some vegetable oil. 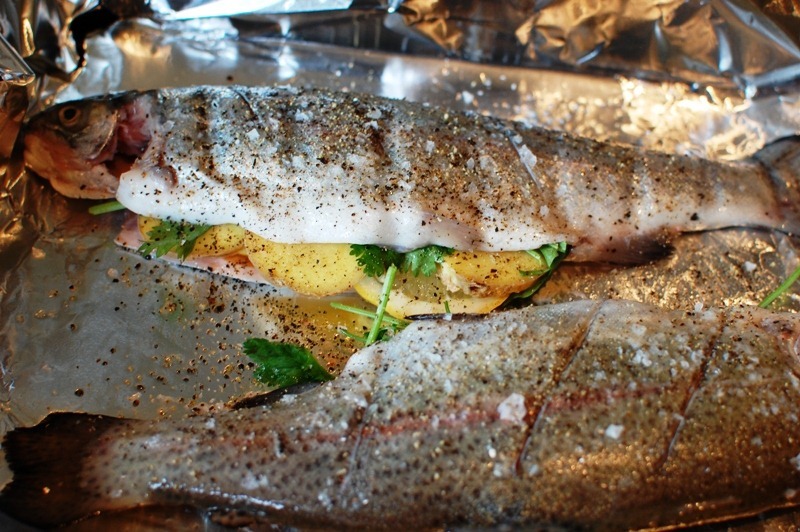 Lay the trout onto the baking tray and salt and pepper both the inside and outside of fish, and then stuff each fish with sliced ginger, lemon and some fresh coriander. Place in the oven and bake for 25 minutes. While the fish is baking, combine all the ingredients for the dressing into a small food processor or blender and whizz together. You don’t want it too smooth, so pulse until everything is in small bits. 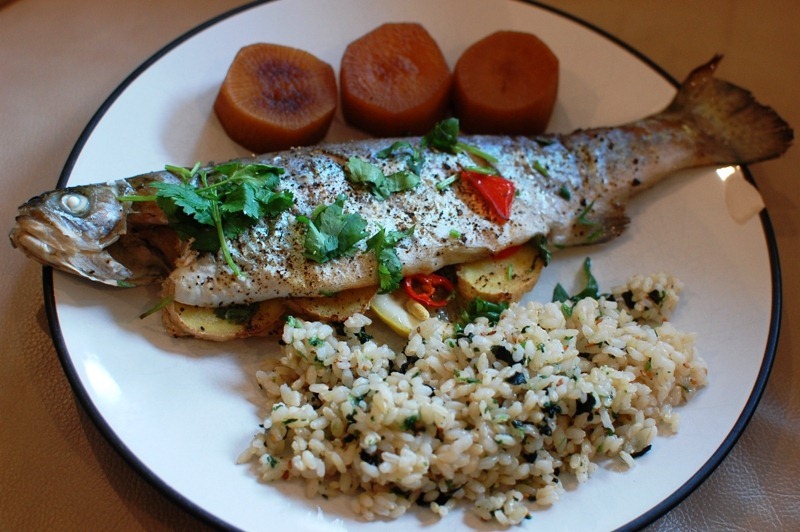 You can also hand chop all the ingredients into tiny pieces and then throw it into the fish sauce, soy sauce, brown sugar, lime juice and water mixture. 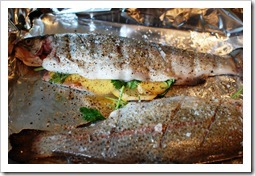 To serve: Remove fish from oven and drizzle on the dressing. Make sure to put leftover dressing in a bowl on the table – you’ll want more, trust me! To cut the daikon: Peel the exterior either with a vegetable peeler or a knife – the outer layer is slightly thick (even though it’s hard to tell) so you’ll want to peel a few layers if using a peeler. Top and tail the daikon, and then cut into 1-inch thick slices. 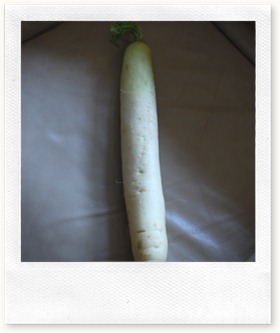 Place daikon into a large pot and pour water over until the daikon is just covered with water. Add in the soy sauce, mirin and brown sugar and bring to a boil over high heat. Lower the setting and simmer for 40-45 minutes. Remove from broth and serve in a large bowl with a bit of the broth poured over the top. And from the best Irish stock too ! I am originally from Mayo. Your ancestor should appear on the 1901 and 1911 census of Ireland, some of which are online. There is a great genealogy centre in Ballinrobe, Co Mayo and that would be a good place to start. Other than that the library in Castlebar. Co Mayo have all the census records on micro-film and they couldn’t be more helpful. You are part culchie now you know ! 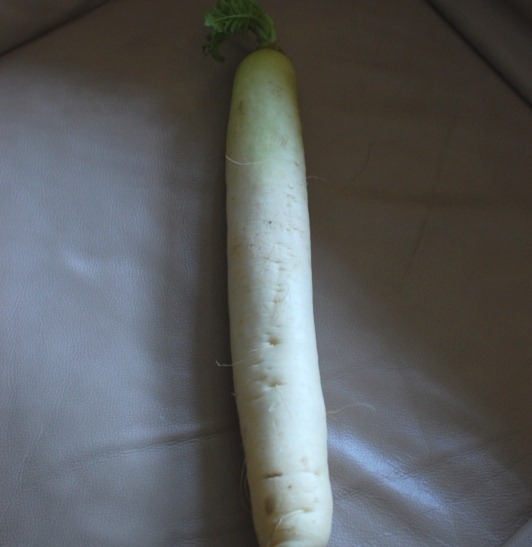 For anyone with any difficulty finding daikon (or mooli as it’s called in India), it seems to be in pretty much all the Far Eastern and Indian/Pakistani stores in Dublin. Ages ago I asked you in a comment about finding nagaimo for okonomiyaki. I’d mistakenly bought several varieties of yam on my hunt, but a couple of months ago I had a eureka moment in the Asia Market on Drury St – behold, there was my nagaimo! So it’s been okonomiyaki central in our gaff since! Brenda: As someone who has pretty much grown up in big cities, I will have to learn to embrace my culchie side, LOL. Emily: Yes, you are correct! In fact, you can get the packets at the aforementioned Asia Market on Drury Street. I’ll do a post soon on all my finds from there so you know what to get and what it looks like. I love reading about your Irish connections. I am not a bit surprised! I recently read that at least 1 in 4 Americans can trace their ancestors back to Ireland. And it was meant to be for you to move there and find your future there. I love the recipe, also! An American in Ireland is powered by	WordPress 4.5.17 and delivered to you in 0.472 seconds using 45 queries.